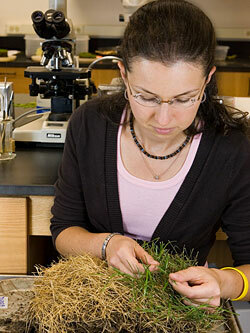 Share the post "Two More Tools For Your Garden"
At the Plant Diagnostic Lab Sabrina Tirpak examines a turf sample for disease symptoms. Spring is here, and with it, “green” dreams! Whether you tend to your yard to showcase the vitality and energy of vigorous plants and nature, to attract compliments as well as the seemingly inevitable wildlife, or to become more self-sustainable with a productive vegetable garden, it pays to know how your plants are doing and what your soil consists of. The Rutgers New Jersey Agricultural Experiment Station (NJAES) provides two important tools for Garden State residents looking to improve the quality of their soil and help their gardens flourish. The Rutgers Plant Diagnostic Lab and the Soil Testing Lab, both located on the George H. Cook Campus, cater to commercial farmers, small businesses, and individual residents. The labs diagnose and mitigate existing problems related to plants and diagnose soil needs to assure optimal growth. With the knowledge and expertise of these two Rutgers-based labs, farmers and recreational gardeners have everything at their fingertips to make their farms, gardens, lawns, and groves thrive, at a minimal cost. The Plant Diagnostic Laboratory and Nematode Detection Service, its full name, is a full-service plant health diagnostic facility of NJAES with the mission to solve plant problems for the residents of New Jersey in an accurate and timely manner. The laboratory serves both residential and commercial plant managers in New Jersey and the Mid-Atlantic and Northeast regions. It also boasts clientele from as far away as California, Arizona, and Florida. Laboratory services include disease and insect pest diagnosis, plant and weed identification, insect identification, fungus and mold identification and nematode assays. 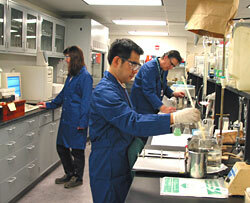 Laboratory services are provided in cooperation with NJAES and RCE faculty and staff. “Since our inception in 1991, we have evaluated around 42,000 plant samples for diagnosis,” said lab director Richard Buckley. “Proper diagnostics help to eliminate the need for unnecessary pesticide and fertilizer applications. We provide science-based solutions to enhance plant performance and when a pesticide is the best course of action, we help our clients in selecting the best product for their needs. The reduction in overall pesticide use is good for the environment and it also saves our clients a lot of money.” The lab has two full-time staff Mr. Buckley and principal technician Sabrina Tirpak. In addition to their role as diagnosticians they also teach in numerous SEBS, RCE, and NJAES outreach programs as well as provide educational resources for many industry and trade groups. The Rutgers Plant Diagnostic Laboratory also participates in federal and state pest monitoring programs. It is designated a National Plant Diagnostic Network Laboratory, under a joint Department of Homeland Security and USDA program, and contributes its services to the Cooperative Agricultural Pest survey. Soil testing lab technicians at work. Dr. Murphy (left) checks progress of an analysis. Sung Won Yoon (center), former graduate student and now Ph.D., works on soil organic matter analysis while Principal Technician Steve Griglak prepares to run an extraction. The Soil Testing Laboratory is a service unit of NJAES and provides fertility and mechanical analysis of soils for the residents of New Jersey and neighboring states and for Rutgers University researchers. 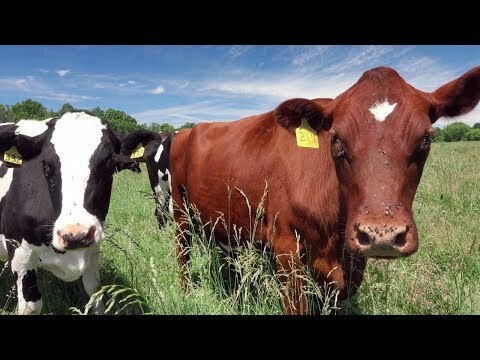 Its mission is to provide accurate and timely soil test reports to meet the unique agricultural and environmental needs of New Jersey. In addition to Murphy, the lab is staffed by Steve Griglak, principal laboratory technician; Phyllis Berger, laboratory assistant; Terriann DiLalo, administrative assistant; as well as several undergraduate assistants who help with many of the basic, day-to-day tasks. The peak time for samples of soil to come pouring into the Soil Testing Lab are the spring and fall. The Plant Diagnostic Lab and the Soil Testing Lab are an integral part of the NJAES and the Rutgers School of Environmental and Biological Sciences, providing diagnostic and educational services in support of the teaching, research, and outreach efforts of the school and experiment station. Both labs obtain most of their support through fees and work to attract grants and contracts from state and federal programs. To learn more about plant diagnostic and soil services at Rutgers, visit http://njaes.rutgers.edu/services/.